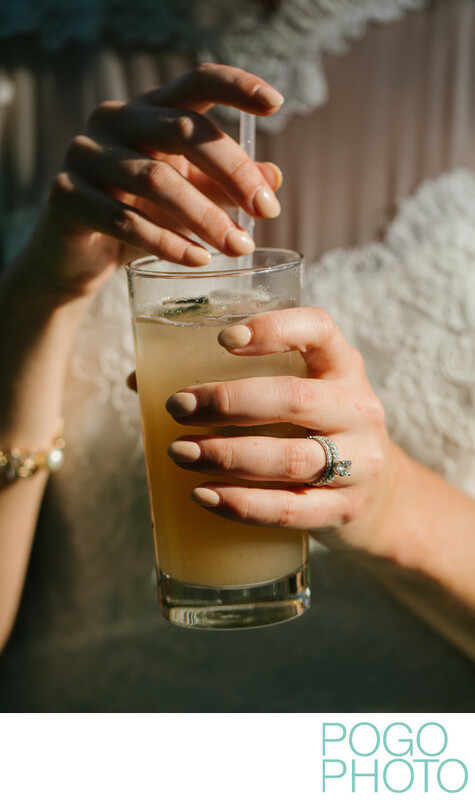 We captured this image of a bride enjoying a cocktail on her wedding day at Vermont’s Basin Harbor Club on the shores of Lake Champlain. Located in Vergennes, Basin Harbor Club feels like a small town in itself. Resort activities abound across the property which hugs the lakeside coast on one side and wraps around the lush greens and fairways of the Basin Harbor golf course on the other. Having Lake Champlain in your backyard, specifically with Basin Harbor itself, offers access to boating, canoeing, or bouncing on a giant trampoline floating in the water. After photographing a wedding all day, we prefer to spend the next day relaxing in one of the many cabins while drinking some bourbon and allowing ourselves to be memorized by the layering of the Adirondack Mountains across the water. Weddings at the Basin Harbor Club are not in just one place. Dawn Wagner, the club’s wedding coordinator and a personal friend of ours, showed us around the entire property and gave us some added insight into the possibilities the space has to offer. Having photographed at Basin Harbor Club in the past, we saw alternate spaces that provide an option for smaller weddings, and a larger room on the southern end that can set the stage for a ceremony, just in case it’s a rainy wedding day. Ceremonies, receptions, cocktail hours, and first looks can be in one of many places across the Basin Harbor Club, including some indoors. Ardelia’s used to be called the Main Dining Room, and now the restaurant hosts receptions of all sizes, including those with dance floors. We love this space just before sundown as light pours in from both long sides of the elongated room, including from the side overlooking the green and harbor. Town Hall has even taller windows, thanks in part to the seventeen foot ceilings, and gives the feeling of more of a ballroom when compared to Ardelia’s. Keeping things indoors while still maximizing natural light is a priority for many brides, and the quaint Ranger Room provides both. Frequently used as a location for cocktail hour, The Ranger Room has multiple access points and room for a bar on each side to help keep the party going strong. Having the feeling of being outdoors while still safely under cover leads plenty of couples across Vermont to an obvious option: a tented reception. Homestead and Lakeside Lawns have enough green space to accommodate tents large enough to house any reception or rehearsal dinner. Outdoor locations are the premiere draw for nearly all Vermont weddings, and you’ll know Basin Harbor Club is elite in this arena the moment you get out of the car. Once you get over the captivating vista and sublime Lake Champlain, you’ll notice one of Basin Harbor Club’s unique fixtures, which is the North Dock. Jutting directly into the lake, the North Dock is a tented space to keep out the sun and possible rain while giving the feeling of floating over the water. Guests can relax, drink, and dine in peace while we create beautiful images in the background and try our hardest not to get distracted by the day so much that we backup directly into the water. Em is the odds-on favorite to do this, based in part on her inherited genetic profile and her father’s propensity for preocupation and walking directly into water, camera gear and all. The Wedding Arch, Lodge Lawn, and the Orchard Garden give brides and grooms three ways to experience their Basin Harbor Wedding. Built for just such an occasion, The Wedding Arch incorporates the surrounding greenery of the area and intertwines it perfectly with the marble aisle, a white entranceway, and an unobtrusive gazebo. Vermont is known for it’s colorful wildflowers and autumn leaves, but Orchard Garden provides that Vermont feel for even longer throughout the year, whether that be for the ceremony, a meeting space, or mingling during cocktail hour. Lodge Lawn is one of the few ceremony locations to blend an impressive and elevated view with shady trees to keep guests comfortable. As photographers, we always love a spot that reduces the amount of squinting, potentially eliminates the need for sunglasses, and lets people smile in smooth, even shade. No matter what aspect of your potential wedding venue you prioritize, Basin Harbor Club has an answer for you. Location: Basin Harbor Club, 4800 Basin Harbor Rd, Vergennes, VT 05491. 1/2500; f/4.0; ISO 400; 100.0 mm.